Silver Maple Farm is an exclusive enclave of ten brand new, luxurious brick carriage homes located in historic Doylestown, Bucks County. Choose from two distinctive home designs, each with individually designed lavish living space and luxury features. Doylestown is the Bucks County seat, and Doylestown Borough is a wonderful "walkable" town with excellent restaurants, a lively downtown scene, quaint shops, exciting music venues and the historic Bucks County Theatre. There are numerous events year round and a unique hometown atmosphere. 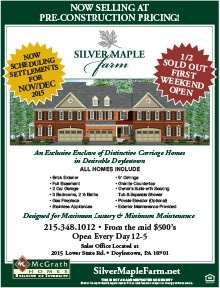 Silver Maple Farm offers luxurious living and convenience with downtown Doylestown just five minutes down the road. Plus, it’s a short drive to Montgomery Mall, Willow Grove Mall, historic New Hope and Lambertville, as well as some of the area’s best museums – The Mercer Museum & Fonthill Castle, The Michener Museum. There are historic sites, and parks in close proximity, and access to the Poconos and Jersey Shore Points are also just an easy drive away. Standard features at Silver Maple Farm include full basements, three bedrooms, two and half baths, gourmet kitchen with granite countertops and hardwood flooring, and 2-car garages. Other options include fourth bedrooms, decks, and elevators. Every McGrath Home is built with superior quality and workmanship, and designed with your needs in mind. Silver Maple Farms offers spectacular brand new brick carriage homes located just outside of prestigious and historic Doylestown Borough.